I am trying to setup the mail on my fedora 20. Every time I try to fire a test mail it tells me the permission is denied on /usr/sbin/sendmail. Am I missing something in setting up the "mail"? Is there anything else I need to do before I can try sending a mail? How can I get the logs to find out exactly what's happening? Your permissions issue is not a file permissions issue but SELinux disallowing the sendmail executable from accessing files on the filesystem in a specific location. Your best friend for dealing with these is to use the SELinux troubleshooter GUI. NOTE: In the above example I've selected the 2nd option and will run the commands semanage and restorecon as described to fix my issue here. You'll need to do the same for your sendmail issue. Yes SELinux, and therefore the tools used to troubleshoot are part of all the Red Hat distros. Whenever I cannot locate the name of a package a given executable is a member of I turn to the command repoquery. Not the answer you're looking for? 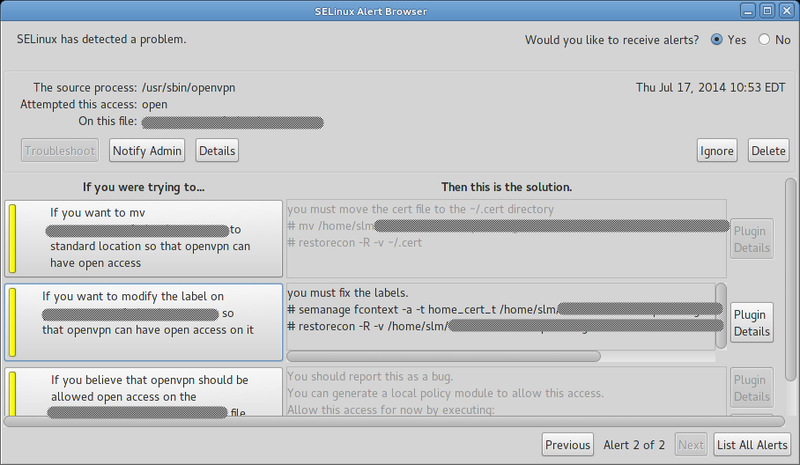 Browse other questions tagged fedora permissions selinux sendmail or ask your own question.